I typically program in Python and use the scikit-learn package for machine learning problems. They have an extensive listing of classification metrics, but I noticed the absence of DET curves. I had never created a pull request for a well known python package before, but I thought I would give it a try: DET curve pull request (as of writing this, there still remains some work to be done on the documentation). For those of you who are interested in doing something similar, here is how to contribute to scikit-learn. 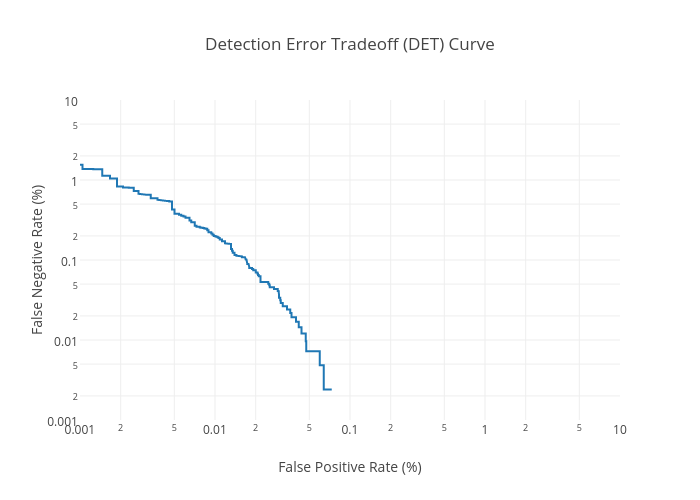 The detection_error_tradeoff function, which takes in a list of prediction values and a list of truth values, produces an output containing the false positive rate (FPR) and false negative rate (FNR) for all threshold values. The DET curve, the line showing the tradeoff between FPR and FNR, is typically viewed in a log-log plot. While Python can easily alter its axes, the default graph does not display the typical tick values as shown in standard speech processing DET curves: 0.1, 0.2, 0.5, 1, 2, 5, 10, 20, 50. In order to create a plot like this, I created the function DETCurve below. An obvious improvement would be for the function to automatically determine the lower bounds for the ticks and adjust accordingly. The alterations to the axes are necessary to ensure matplotlib does not try to plot zero on the log plot (which would set it to infinity and cause issues). Given false positive and false negative rates, produce a DET Curve. negative rate is assumed to be decreasing.